Fill the ride informations and get your quote plus the savings from booking in advance. The price is fixed, you will not be charged with any additional costs. Use the airport button ( ) to easely select your airport and your terminal. Fill also your flight number, and so Marcel will follow your flight and will freely take into account any possible delay. And add 15 minutes more if you have a checked luggage. Marcel is the leader of booking in advance. The sooner you book your private hire, the cheaper it is. Have foresight, and book your favourite private hire at the best price. On top of offering a competitive price, Marcel offer the best quality of service. You will be transported in a premium sedan with a very considerate private hire. The car can transport as much as 4 passengers (check our advises for your luggages on our Q&A in the section “Airport & Train Stations”). If you are more, or if you have a lot of luggages, Marcel put at your disposal vans of 7 places. HOW MARCEL CAN BE SO CHEAP ? Marcel calculates his prices with various criteria. The most important is when you make your reservation. 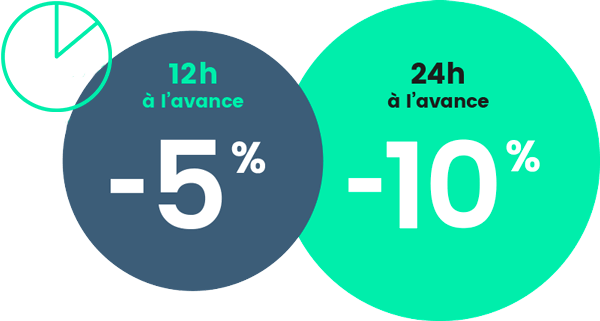 Marcel offers 10% discount on rides booked at least 24 hours in advance and 5% discount for rides ordered 12 hours before the departure. Marcel takes also into account the length of the ride in is price. Finally, Marcel, with a performant trafic forecast tool, estimate the duration of your ride and adjust the price according it. Now that you know why Marcel is not expensive, do a qote for your traject to Orly or Roissy Charles-De-Gaulle with the form at the left of your screen, and you will see that Marcel has nothing to envy from Parisian Cabs. It is free and does not need any inscription. HOW TO BOOK YOUR RIDE TO THE AIRPORT WITH A PRIVATE HIRE ? Better than an airport cab, book in a few clicks by using our module at the left of your screen or using our homepage. For airports, the waiting time for your private hire is free until 20 minutes after your departure time, on which Marcel advise you at the booking time. After that, it is billed 0,6€/minute for Standard Sedan and 0,7€/minute for Premium Sedan and Vans. To avoid misanderstandings, we ask for your flight number to anticipate the possible delays. This is why it is important for give us your flights informations. It is free of course and we will alert your private hire. Marcel has also set meeting points in airports to ease the meeting with your driver. Finally, you will recieive by text as soon as you land the private hire coordinates to contact him and organise a meeting. You don’t need any more to look for a taxi at the airport. If you have questions about the prices, the ride or other things, feel free to contact us at contact@marcel.cab, our operational team is at your disposal and well be please to answer you.